Making predictions in the world of business is important. Without this, there is no scope for any organization to flourish whatsoever. The analytics used to make predictions about future events is called predictive analytics, and the process is called predictive analysis. According to a study by EverString and Forrester Consulting, 89% of B2B marketers have predictive analysis on their agenda for this year. Marketers who engage in making predictions are 1.8 times more likely to unfailingly exceed shared organizational goals. This is because the process helps them in filtering risks and spotting opportunities for the business. The Big Data boom has made predicative analysis easier because of the availability of infinite data splashed in the form of advertisements, blog posts, social media feeds, PDFs, ordering information, call centre transcripts, surveys, marketing literature, etc. Studying patterns and identifying customer behaviour is a piece of cake today – provided the right tools are used. While predictive analysis has been around in the healthcare sector and financial services industries for the last one decade, B2B marketers are finally taking notice of it. 4. Ever tried hyper-segmentation? You should! In the B2C spectrum, demographics are important. Age, gender, location, race, etc. do hold relevance when it comes to predicting the target audience – but in a B2C environment. B2B firms, on the other hand, work differently. They must focus on firmographics or profiles developed on qualities that apply to prospective businesses, not individuals. Attributes such as annual company revenue, acquisition cost, average purchase size, sales cycle, geographic location, etc. are defined by B2B marketers. Here, the data is easy to obtain and assess as the companies with similar firmographics have more or less similar needs and relationship profitability. With predictive analysis, efforts put in all activities can be maximized. Imagine producing only those strands of content that are bound to generate a favourable reaction from the customers. This would make the life of marketers easy, isn’t it? Well, that is what exactly happens. With this model in place, marketers can put together easy-to-consume infographics and detailed e-books for the target customer base. Whether or not the new customers want to see how-to tutorials on YouTube can be answered through this type of analysis – for instance. 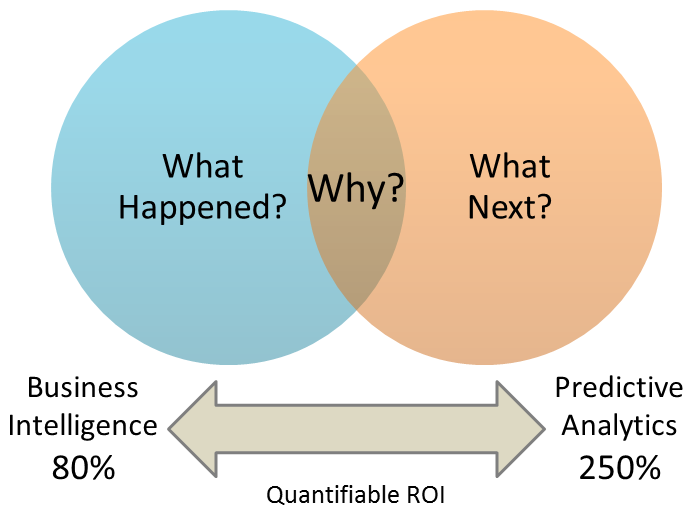 The quantifiable ROI of businesses that incorporates predictive analytics is nothing less than 250%. If one can anticipate needs and detect preferences, then all efforts can be put to improve the message content & timing and to increase relevancy. Why? Because that way it is easier to identify the interests of specific individuals or very small factions of like-minded individuals and influence their thoughts and actions. “Who are my existing customers?” “What do they have in common?” “What are they looking for?” – Questions like these can be easily answered through predictive analysis. The B2B marketers can understand their target customer base so well that they are able to deliver the right message, at the right time and through the right channel. It is all about spotting the individual customers and bundling them up on the basis of the patterns observed, or their action that demonstrates that they are open to buying your product. According to an article published in Forbes, prospective buyers are increasingly taking the online route to educate themselves about products and services. This means they know exactly what they want. And the sooner B2B marketers understand this, the better they can command leadership position across product and service categories to maximize customer satisfaction in every possible way. The method of using data to identify and communicate with the customers on a granular level is called hyper-segmentation. 82% of prospective buyers feel that content targeted to their interests is not only more relevant but also more valuable. With hyper-segmentation, the marketers can know exactly who the customers are, where they are from and what they need. Predictive analysis helps in creating supply for the demand predicted by the data obtained from various marketing channels such as social media feeds, online surveys and call centre transcripts. As soon as the deliverables from the marketers’ side get prioritized and personalized, satisfaction levels increase manifold because the customers are being offered exactly what they are or were looking for. A study by SiriusDecisions states that 60-70% of content produced by B2B companies goes wasted or unused. This is because they don’t conduct proper research about the needs and wants of the target customers. And it is not just about the time and efforts gone into making a marketing strategy that generates unimpressive ROI, but also the monies pumped in to make it a success. In the concept of predictive analysis, both micro-targeting and hyper-segmentation are taken into consideration to reach the right people at the right time and at the right places. This can, certainly, revolutionize the B2B marketing strategy for any organization. Predictive analysis is a powerful tool, and once B2B marketers get a hang of it, it can generate more fruitful results by extending the customer life cycle and even increasing the revenue generated by each individual customer.